Based on the facilitation techniques of Arthur Hull, this video is a complete introduction and guide to the concepts of facilitating successful community rhythm-based events. 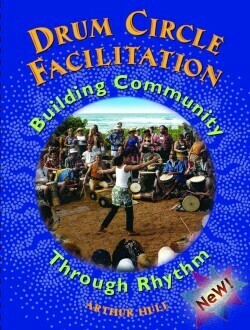 Learn how to facilitate extraordinary drum circles for groups ranging from children to corporate executives. Explore a series of fascinating rhythmic technologies and techniques for building bridges and enhancing personal connections in a host of settings. This video utilizes information from the book, Drum Circle Spirit: Facilitating Human Potential Through Rhythm, and the VMC Facilitator Playshop training programs. It was shot at the 6th annual Village Music Circles week-long Hawaii Facilitators’ Playshop. It includes 120 playshop participants who came to Hawaii from eleven different countries. Although the video is designed for the beginning beginner facilitator, there is plenty of intermediate and advanced information included. – Remo D. Belli, founder & CEO, REMO, Inc.